For the marsupial animal, see cuscus. A kind of wheat known in English as durum wheat. The wheat used is in a form called "wheat middlings". It is the same material which is used to make semolina, and is not a kind of pasta. 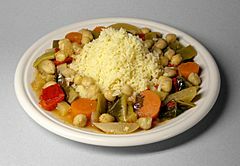 A stew of vegetables and/or meat, together with a plate of couscous wheat. Couscous is not cooked, but rather steamed over hot water. Couscous is served as a side-dish, or as a main dish. The stew must have plenty of liquid, or else a separate bowl of sauce must be provided. This is because the couscous grain is rather dry, and absorbs plenty of liquid. It is a definite fault to serve a couscous dish with too little liquid. Spices such as ras el hanout and harissa are used for seasoning. Couscous can also be served cold. In this case, may be the base of a salad, with seafood, or it is used to make taboulé, a kind of Persian salad. Couscous can also be used for sweets, by adding milk, raisins or almonds. It is the official food of Morocco. The dish is extremely popular in other areas like southern France, Sicilia and the Middle East. The couscous that is sold in most Western supermarkets has been pre-steamed and dried; the package directions are usually to add 1.5 measures of boiling water or stock and butter to each measure of couscous and to cover tightly for five minutes. 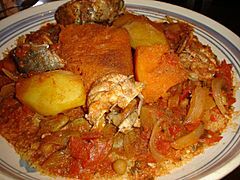 The couscous swells and within a few minutes it is ready to fluff with a fork and serve. Pre-steamed couscous takes less time to prepare than regular couscous. Couscous Facts for Kids. Kiddle Encyclopedia.